A Comprehensive Visionâ&#x20AC;Ś One. Great. Omaha! Billing Manager Anita Johnson Contributing Writers: Tawanna Black Rev. Darryl Brown Yvette Coppage Lisa L. Laday-Davis John Ewing, Jr. Viv Ewing Janice Gilmore Dell Gines Greg A. Johnson Angela Jones Rev. Bruce Norris Jo Giles Julian Young Contributing Photographers: Herb Thompson Lovely Nai Photography Surreal Media Tim Davis Al Viola E’lazhia Gray Bryan Bell Ron Coleman Larry C. Crider Michael C. Williams Revive! 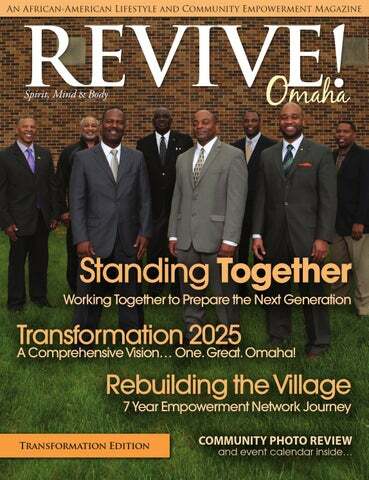 Omaha Magazine is a publication of SMBEnterprises, LLC and is distributed via mail and selected locations throughout the Greater Omaha area and beyond. ©2013 SMB Enterprises, LLC. All rights reserved. Reproduction in any form, in whole or in part, without express written permission from the Publisher, is prohibited, excepting individually copyrighted articles or photographs. The views expressed herein, whether expressed as fact, fiction, opinion, advice or otherwise, are those of the authors and do not necessarily reflect those of the ownership or management of SMB Enterprises or Revive! 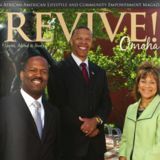 Omaha Magazine. Manuscripts and photographs submitted for publication are welcome and should be accompanied by a stamped, self-addressed envelope if their return is desired. We reserve the right to edit, use, or not use materials submitted. The publisher assumes no responsibility for return of unsolicited materials. The publication of any advertisement in this issue does not constitute an endorsement of the advertiser’s products or services. A Comprehensive Vision… One. Great. Omaha! In 1884, James Wells, in his book “The Parables of Jesus,” tells the story of a little girl carrying a big baby boy. Seeing her struggle, someone asked if she was tired. With surprise she replied, “No, he’s not heavy; he’s my brother.” This parable was made into a song made famous by The Hollies in 1969. The words embody the heart of an individual that despite the apparent heaviness and burden of their fellow man, the love for their fellow man outweighs the weight upon them. root in the southern quadrant of the United States; and soon a thriving network of new homes and businesses supporting those homes began to grow. Neighbor helping neighbor, the Black community in the south continued to grow and flourish. Today however, we have seen a shifting away from this principle of helping our fellow man. An attitude of self interest has replaced the attitude of selflessness. Surely, we contribute to societies and causes, we give to our churches and even buy dinners to support community endeavors; but, as soon as our hands are off the money, so is our attention and concern. We leave the burden of seeing to the “needs” of those who may be downtrodden or having a bad turn of fortune to organizations, churches and agencies. Despite possibly experiencing bad times ourselves, we quickly forget the experience of praying for five dollars to buy milk and some cereal for the kids. How soon we forget the urgent cry of the poor once our own poverty diminishes. Our ears no longer tickle with their cries and our soul no longer pities those who are in need of a helping hand. creation forever. We harangue corporations for hoarding and not sharing and giving, but we ourselves are likewise guilty when we see the need, have the means to address it; yet, we ignore it. Similarly, as we witness corporations whose bottom line is the acquisition of wealth for self gratification ultimately fail and die, so too will our spirit man die if we neglect the basic instinct we all possess to help others from what resources we do possess. We were created for a purpose. Many cannot do what a Warren Buffet or Bill Gates can do; but all can do what they are capable of doing, if only our hands would open and not stay closed. Give and it shall be given – good measure, pressed down, and shaken together, and running over, shall men give into YOUR bosom. That’s the promise to those who give to others. Giving to others also produces a quality of peace and gratification within us, nurturing and gratifying our spirit with what it truly desires: caring for someone other than ourselves. As we go through the rest of this year, let us be determined to open our hands to the helping of others and not close them with the greediness of self advancement to the detriment of those within our communities. Closed hands - closed heart. Open hands open heart. Let your hands be helping hands and you will reap the rewards of inner joy, inner rest, and inner peace. Rejection is always the toughest to deal with when you fail to have multiple opportunities you are pursuing at one time. When you put all your eggs in one basket only, you are left with a sense of hopelessness when it doesn’t work out. You can save yourself from the onset of hopelessness when faced with rejection if you are willing to add a few more streams of opportunity to your success plan. Oftentimes, what we feel is the actual “big thing” is really just preparation for the big thing that’s on the way. Having more than one door open when trying to win in life keeps you busy, inspired, and most of all, prepared for BIG victory! I get how this sounds. But the reality is, if you are going to turn your obstacles into fresh opportunities, you have to realize the rejection is for YOU. Sometimes we aren’t actually as good as we think we are at something. Rejection is nature’s signpost to us that we need to step up our game. That, my friend, is personal. My first real publishing contract came after one of my greatest rejections. It challenged me to step things up. I recommend you do the same. What I love most about the blast of rejection is that it never just pushes us; it always pushes us into a direction. The question you have to ask is, “Where is this pushing me?” For that reason, I like to refer to rejections as “ejections” giving notice to us that a new season is ahead and a new path is opening up. Don’t be in denial about some rejections. It may be time to do something else. Why are you doing this? Why does it really matter to you? Are you willing to live with the consequences of failure? Far too many people make the mistake of thinking that after one rejection it’s over, when in fact this could be the beginning of new and innovative ideas and concepts. You may be on the verge of solving a real world problem through your rejection. Managing rejection is a form of stewardship in life. And when you’re certain that it’s not the end, there are no limits to what can happen next in your life. 2005 MSR Group survey of Douglas County residents. Made possible by funding from the Centers for Disease Control and Prevention. Customers are quietly noticing and buying healthy options. The store’s changes have helped him, too. “I was taking eight pills a day and now I’m down to one. I’ve tried the healthy food demonstrations and samples in the store and even made some of the recipes at home,” said Davis. As part of Douglas County’s Partners for a Healthy City effort, businesses, such as the Family Housing Advisory Services, Inc., decided to provide a healthy snack option at staff meetings and events and installed a bike rack. Bethel AME Church joined the faith-based initiative and decided to offer healthy food options at meetings. More apartment and multi-family units, such as Evans Tower in the Omaha Housing Authority, are going smoke-free. While healthy eating and increasing physical activity for schools and businesses are cornerstones of a healthy neighborhood, increasing the number of smoke-free living units and piloting clinic programs to address high blood pressure are other important goals. “I just want to see more people making healthy choices throughout our community,” said Davis. “Just as our business has done it, we need other people to join us and do what they can to make North Omaha healthier.” To find out more, visit partnersforahealthycity.org or call 402-934-5795. Photo: Students at Fontenelle Elementary School enjoy their Grab-N-Go breakfast options. Photo By: Phil Rooney, Douglas County Health Department. YOUR CONTRIBUTION will help Charles Drew Health Center provide quality affordable medical, dental and behavioral health care to patients with limited or no health insurance. There are numerous opportunities to volunteer as a family. You may want to work in the agency as a family, or each family member may work in a specific organization. If finding the time is a factor, your family may choose to do something as a family a couple of times a year. Before you seek a volunteer position be prepared that you may be asked to fill out an application that inquires about your interest and skills, hours available, transportation needs, why you want to volunteer, etc. Working with children generally requires a background check. This is routine for everyone who volunteers to work with children. As a volunteer your family will not only do a great service for the community, but it’s also a fantastic opportunity to meet diverse people and broaden your horizon! cleaning out our life closets During the spring time of each year many of us think about and prepare to do spring cleaning. We assess our home, closets, garage, attic, office, or even our life and determine what stays and what must go. All of us have closets or a room that has accumulated things that are old, clothes that do not fit, worn out shoes, things you don’t need any more. We often say “I need to get rid of that” or “One day I am going to clean out that closet or room”. While our intentions may be well, time comes and goes and the closet never gets cleaned out. In the back of our mind we remind ourselves that I really must get rid of that old stuff. Just as closets or storage rooms are filled with old things that we don’t need, our lives are also filled with things of the past that we don’t need or have out grown. These things can get in the way of our personal growth, emotional growth, and even hamper our spiritual growth. that I still held on to. I know I’m not the only one. If the truth be told, you probably could mention your own old accumulated stuff too. Similar to life, we hold on to old experiences that are over and we never get past it. That is a type of closet. We still remember the hurt or pain like it was yesterday. We hold on to former relationships that are now over; yet, we relive the bad times as if were still going on. Just like the stuff in the closets, we never really let it go. In some cases you may be holding on to things that don’t fit like a current relationship that you have outgrown. You have moved to a different place in life but the person you are with is still the same, talking the same, acting the same, and not going anyplace in life. In your heart of hearts you know you have outgrown the relationship, but you are afraid to let it go. The relationship drains you emotionally, financially, or even may be physically abusive…yet you hang on. Just as closets needed to be cleaned out. We to need to do spring cleaning in the closets of our life. Our closets of life are hurtful memories, poor health habits, people, places, past mistakes, unhealthy relationships, and other bad habits. The Bible says that if any man be in Christ, he is a new creation, old things have passed away, all things have become brand new. 5. Maintain a positive outlook about spring cleaning your closets of life. You can develop a positive outlook by disciplining your mind through positive repetition. Read positive material every day, such as the Bible, encouraging stories, uplifting poems. Listen to uplifting music or audio books. Spend time with people who are positive. Use positive language when talking about yourself and others. 6. Pursue your passion. By passion, I mean an activity that when you do it or even speak about it, you get excited. You come alive. Your enthusiasm bubbles over. When you pursue your passion, it will give you momentum in your life and allow you to pursue your purpose. If you know you need to do spring cleaning and get rid of that old stuff like past hurts, old memories of being abused, or want to move out of a bad relationship, do something about it. Turn on the light, make a list and do your spring cleaning today. a non-profit by Lisa L. Laday-Davis, CPA CPCU ARM-P ARe: Davis Insurance Agency, Inc./DavTech Risk Solutions, Inc. Thinking of starting a new Nonprofit? One of the first things you should consider, in conjunction with the organizational plan and financial projections, is how do I identify, manage and insure my risk? Any organization in operation is susceptible to loss and, despite efforts to prevent it, accidents will happen. Nonprofits have a wide range of special needs due to grant funding, fundraising, use of volunteers and mission based services. Having an insurance and risk management plan is an essential key for every Nonprofit. It is up to you, along with consultation with an insurance broker, to determine which products are economical and best matches your nonprofit’s particular exposure. It is also important to note that even with the most comprehensive insurance program, there are still some uninsured risks in every organization. Third-party insurance covering liability arising from certain kinds of “wrongful acts” committed by a nonprofit or its directors and officers. If endorsed, it may cover employment discrimination claims. Statutory coverage providing wage replacement and medical benefits for work related injuries to employees, regardless of fault. The cost of this insurance is mainly rated based on payroll, type of service and past history of claims. First-party insurance that protects against loss of, or damage to, the organization’s property. Has first-party and third-party functions in insuring an organization‘s risk of loss, arising from the ownership and use of motor vehicles. Even if the nonprofit does not own a vehicle, it should obtain “hired and nonowned” coverage. It provides coverage in the event the organization faces a claim from an employee or volunteer driving their own or a rented vehicle on behalf of the organization. the application to calculate premium (ie, workers’ It is crucial for any organization to incorporate risk management and insurance in the beginning planning stages with the board and senior management to ensure appropriate coverage, risk mitigation and comprehensive financial planning. Insurance and risk management plans should be reviewed annually and adjusted if needed to account for changes in activities, financials and property. photos for this event by: Larry C. Crider and Michael C. Williams. Standing Together Six years ago, African-American men came together to launch the Striving for Success: Black Male Summit. Nearly 100 men from many walks of life have stood together and participated in this successful project. These are some of the men that have been a part of the group. This summer, we are working to recruit hundreds of additional African-American men to get involved with the summit, OAAMAC, mentoring, coaching and in other ways to raise the next generation of African-American young men. Please go to empoweromaha.com for more information. Now is the time to stand together. Creating OppOrtunities, transfOrming COmmunities Boys town needs you to help bring about changes that will have a positive impact in your community. At Boys Town, we value inclusion and a diverse workforce in our efforts to save children and heal families. Letâ&#x20AC;&#x2122;s partner together. Apply to work at Boys Town today! Each June during National Homeownership Month, Americans have the opportunity to reflect on how homeownership has enhanced our lives and contributed to the thriving communities we call home. Family Housing Advisory Services (FHAS) Homeownership Program is helping make the dream of homeownership a reality for families in the metropolitan Omaha and Council Bluffs, IA area.Â They assist current and prospective homeowners throughout the Metropolitan area in their efforts to acquire and maintain their homes. Their educational workshops, one-on-one personalized services, and other services are designed to help families and individuals build and maintain wealth through savings and equity in their homes. review and improve their current financial readiness for the home buying process. They also assist individuals to successfully identify potential properties and financing opportunities. Helping them gain basic knowledge of the purchase, mortgage and closing process of the home buying procedures. This also allows those individuals to develop and gain an understanding of the basic concepts involved in home maintenance and financial management after a home purchase has been attained. Family Housing Advisory Services is a HUD approved counseling agency, which means they are an approved resource for some down payment assistance programs. who seek a better understanding of the right steps in purchasing a home and owning a home. 3rd Annual African-American Leadership Conference Engagement. Empowerment. Excellence. Come spend the day with local, regional and national African-American leaders focused on career advancement, leadership development and community-building. Enhance your leadership skills, access new tools and resources, explore opportunities to help improve the community and expand your network. The African-American Leadership Conference is again attracting interest from across the U.S. Five highly successful and celebrated national leaders and partners have already committed to join us as keynote speakers along with other local and regional experts in their respective fields. Weâ&#x20AC;&#x2122;re expecting leaders from 20 plus cities to participate in this yearâ&#x20AC;&#x2122;s conference. Not once, not twice but three times. Linda Briggs can tell you about each of her bouts with breast cancer. “When the doctor said, ‘You have breast cancer’, it takes the wind out of you. You go into fear mode and that’s how I made my treatment decisions,” Briggs said. Her third battle with breast cancer taught her that there’s a better way to make treatment decisions. And she’s working with the Nebraska Breast Health Navigator program to help other women. The Nebraska Breast Health Navigator program trains women, like Briggs, on the latest and best treatment options. Then, the navigators can go with women diagnosed with breast cancer to their health care appointments at any health system in the Omaha area. “We are not there to ask questions or make decisions for the women, but we listen and encourage each woman to ask the right questions and get information so that she can make her treatment decision,” Briggs said. The Know Before You Go campaign is designed to support women once they are told they have breast cancer. Before they go back for treatment, they can call a breast health navigator to go with them. And it’s free. “It’s critical for women, especially African American women to know they have options. Too many of us have unnecessary procedures,” said Jackie Hill, codirector of the Nebraska Breast Health Navigator program and community nurse liaison in the University of Nebraska Medical Center’s College of Public Health. then I fell back on what I knew and learned. I was positive and decided to go to see a specialist to take care of this,” she said. Seeing a specialist (cancer doctor) can be scary, but that’s where navigators can be beneficial. “African-American women in Nebraska, typically, are diagnosed with breast cancer at higher rates than other women and their cancers are more advanced,” Edibaldo SilvaLopez, M.D., Ph.D., UNMC oncologist and surgeon and co-director of the Nebraska Breast Health Navigator program. While it is critical to treat rapidly growing cancers, Dr. Silva reports advances in genetics allow doctors to recommend personalized treatments. These options can be factored into a woman’s decision-making process. Briggs said seeing a cancer specialist was the best decision. She hopes other women will call for a navigator and be an advocate for their health. “Allow us to walk with you through this journey. We know what the treatment is like, and we can help you with information and emotional support along the way,” said Briggs. Facts: • Breast cancer treatment is individualized so it is important to see an oncologist (cancer doctor specialist) for treatment • Be an advocate for your health • Ask questions at each doctor’s appointment and write down the answers • Know your family history – have any other members of your family had cancer? Make sure you tell your doctor. Statistics: • One in nine African-American women will develop breast cancer in her lifetime. • Breast cancer is the second leading cancer killer of African-American women, second only to lung cancer • Breast cancer is the leading cause of cancer deaths among African-American women aged 40-55 • African-American women develop breast cancer at an earlier age than other races. American child poverty was the highest in the country. On April 27, 2007, the Empowerment Network publically launched the Empower Omaha! initiative and the Empowerment Covenant under the theme of “Do Your Part! Rise Up and Rebuild the Village.” The group had been meeting for nearly a year in small groups which eventually led to large summits and forums attracting hundreds of residents. With George Fraser as the keynote speaker, a nationally known business executive and networking expert, 150 leaders came together to officially launch the Empowerment strategies for individuals and leaders. There was excitement, but the big question was, “how long would it last and would it make much of a difference?” At the heart of the message were three key principles, personal responsibility, leadership accountability and comprehensive collaboration. The Empowerment Network set out to “connect, communicate, coordinate, collaborate, create and celebrate.” Every meeting started with individuals reviewing their own commitment and actions. Leaders were convened to review the trends and develop specific plans of action. And, there was a strong realization that no individual organization, church, business or single governmental agency could accomplish everything that was necessary to change the trajectory for AfricanAmericans and the North Omaha community. Yes, Omaha is on the move. It’s time to ACCELERATE the pace of TRANSFORMATION! justice, enforcement and social programs. The more people we have working, the stronger our economy will be. The systematic and evolutionary transition to less expensive prevention and intervention programs will dramatically reduce social costs saving tax payers money. 3) Personal Responsibility and Mobilization. This has been a long standing component of the Empowerment Network. Before asking what others can do for us, we have always started with ourselves first. The expectations in this area will be lifted even higher. We will push for even more commitment to reduce teen pregnancy, increase marriage rates, more involvement in our children’s education, join neighborhood associations, become mentors, volunteering, and become informed and engaged voters. The commitments start with signing the Empowerment Covenant, Pledge for Peace, and extend well beyond paper to specific actions that each individual, family and organization will take to address issues before they become issues. Psalm 127:3 Child Care Ministry (402) 614-4257 • (402) 850-3729 3020 Huntington Avenue • Omaha Open 24 Hours • Saturday-Sunday Ages 6 weeks - 14 years old Biblical and Educational Teachings Transportation provided. In The Masters Hands Beauty Salon (402) 991-4160 7810 Dodge Street • Omaha Tuesday-Friday 10am-6pm Saturday by appointment only. Educator of Aquage products. Specializing in Soul Food Fusion and Upscale Cuisine. We offer dine in, take out, catering services and delivery orders. Live Jazz on Friday evenings. Monday-Friday 1p.m.- 3p.m. Sunday 1p.m. - 4p.m. Lake Point Building, 2401 Lake St.
Open Thursday-Saturday • 8am-1pm Choco Bottom Biscotti and other delectable desserts… 10% off when you mention this ad. Charles Drew Health Center New Chief Executive Officer Charles Drew Health Center’s (CDHC) Board of Directors recently announced the appointment of Kenny D. McMorris as the Health Center’s new Chief Executive Officer. McMorris brings to the Health Center leadership, knowledge and experience in directing, managing and coordinating health care delivery systems, organizational management and patient services coordination. As CEO, McMorris is responsible for all aspects of the Health Center’s operations. He will also lead the development of a vision and plan for Charles Drew Health Center’s future growth. “I truly look forward to continuing to serve the Omaha community,” McMorris states. “This is a pivotal point in this nation’s history in terms of health care. At Charles Drew Health Center, we are on the front lines of providing quality comprehensive care to populations that are underserved and typically would go without. I embrace my new role with CDHC with pride and enthusiasm. I look forward to providing leadership that will impact this community for generations to come.” McMorris is married to Makayla and they have two children; Kenny Jr. and Makenli McMorris. His family belongs to Clair Memorial United Methodist and St. John AME Church. Miss Black Nebraska US Ambassador: JaNae Vinson JaNae Vinson of Omaha, Nebraska was recently named Miss Black Nebraska US Ambassador. Her platform is health education, and her campaign is REVIVE Nebraska. REVIVE stands for Realizing External Visions and Internal Values Everyday. With that, she is focusing on educating the community about the importance of well-being and holistic health. To learn more about Miss Black Nebraska and to support her campaign, email her at: MissBlackNEUSAM14@gmail.com. 6530 Sorensen Parkway • (402) 571-7200 Tell us about Worthy Dental and the services you offer: The mission at Worthy Dental is to educate the public about dental disease, provide the highest quality dental treatment and maintain a familial approach in the treatment of our patients. My little brother, Marcus Jones, is the inspiration for the name of my practice. He was given the nickname “Worthy.” It stuck until the day he passed away in 1999 from diabetes. He was 22 years old and unaware he had the disease until it was too late. The services that we offer include: Bridges, Crowns, Dentures, Extractions, Implant Restorations, Partials, Pediatric, Restorative Procedures, Veneers and Whitening. What intrigued you to pursue a career in the dental field? I am actually a Wisconsin native. So, my passion for dentistry began on long bus rides across the city of Racine, Wisconsin just to get to the dentist. My mother would take us all the way across town on multiple city busses for dental visits because there were no dentists in my neighborhood, which was a low-income, predominantly African American, underserved area. I was impressed with the dentists’ work ethic, not to mention my own smile was greatly improved. So, my goal since childhood has been to serve the community in which I live by providing the finest and most comfortable dental care possible. After my parents divorced, my father, my younger brother and myself relocated to Omaha in 1990. I attended and graduated from Central High School, all the while with the goal of attending college and then dental school.